The duty of the packer is to provide a seal between the tubing and the outside world, preventing the escape of well fluids, from the casing or production tubing into the atmosphere. This is both a safety and an operational function. As wells have been worked at ever higher pressure, so the safety function becomes ever more critical. The operational function is equally vital, since no coil-tubing operator wants problems from the seals when running in or out of hole. Various problems can arise and in consequence, a wide range of packers has grown up. It is increasingly necessary to select a product for the type of job in hand; one which has been suitably tested. For example, many standard packers would not rate above 100-120°C which is inadequate in a hot well. Now materials are available which can stand up to 160°C or even higher temperatures. Conversely, an operator may need to operate in frozen wastes such as Alaska requiring rubber which will not crack at -50°C. Other difficulties arise trying to energise in very low pressure wells, or the rubber might have to survive a well trying to escape at 6500psi. Appropriate solutions are available for all these situations. 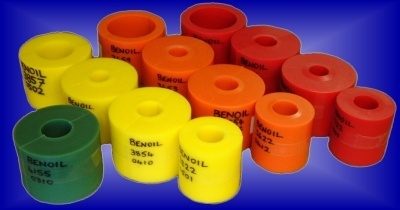 Benoil has recently developed a self-lubricating rubber which reduces the energy required to move the tube through the seal. This leads to reduced wear and is of particular benefit on startup when it can otherwise be difficult to move the tube through a rubber which has locked on to it after having been static for some time.